Please note: I have just relisted with Homeaway and lost all my reviews going back to 2002. For reviews of the house please see VRBO where it is property 12424. Menerbes was the village that inspired Peter Mayle to write ‘A Year in Provence’ - it is one of the select group of hill-top villages in the Luberon National Park and officially one of the Most Beautiful Villages in France. The whole point of the house is the view of the mountain opposite and the valley below - it is beautiful, and one never tires of it. I maximised the view by adding and enlarging windows in every room so that now the mountain is always framed in a slightly different way wherever you are in the house. The house seems to hang above the valley. The house was made up of five rooms in a row, all facing south to the mountain. Due to curiosities of construction and the angle of the road, there is also a downstairs part on the right hand side of the house. This houses the second bedroom, which has twin beds that can be brought together to form a large double. This room has an en-suite bathroom with bath and overhead shower, WC and basin. Now getting back to the five rooms upstairs: I decided to open out the house to make the most of the light. So I knocked an opening between each room and put in arches - you can see this effect in the pictures. The rooms are, from left to right - living room with outside loggia; dining room and kitchen; entrance hall and stairs down to the guest room and laundry; dressing area and wardrobe with daybed; main bedroom; and bathroom. Because of the angle of the road each room is on a slightly higher level than the previous one, which is a charming effect. The main bedroom does not have a door, it has a large screen to split it off from the rest of the house: this offers privacy, but obviously not as much as a locked door. I never found this a problem when friends came to stay. It does give you complete privacy from the other bedroom, because this is on a lower level which does have doors. The main bedroom has a double bed and the bathroom has a lovely walk-in shower with a large shower rose, WC and basin. The house can accommodate four people - two in each bedroom, each with its own bathroom. There is satellite TV with CNN, BBC News and CNBC and DVD player with library of movies. And WiFi internet throughout. It should be noted that the fireplace should not be used when the wind is blowing, as the smoke comes back down the chimney. The house is in a narrow road at the very highest point of the village. The street leads nowhere, so it is very quiet. The shops, restaurants and bar of the village are a 2-minute stroll away. There is a dossier at the house explaining how everything works and listing good places to eat, things to see, etc. There is also a small library of books about Provence, including the best up-to-date guidebooks. Menerbes is the heart of one of the enchanted corners of this world. Everything you read about in ‘A Year in Provence’ is here - the lavender-scented landscapes; daily markets overflowing with local produce that actually tastes of something; quirky customs; hilltop villages rising above the sea of vineyards and sunflowers; outstanding food and wine; and the sensational quality of light that has always brought painters and poets here. In Provence, everything simply tastes, smells, and looks better than at home. And it’s all right on your doorstep. This is a year-round destination - the Luberon in winter is as beautiful in its way as during the long summer that can stretch from May to October. High above the cares of the world, the house is perfect for a romantic couple (or two) - whether inspired by the ever-changing light or comforted by a roaring log fire. Everything is included in the price of the rental - central heating, electricity, towels, bed linen, logs for the fire, weekly clean. 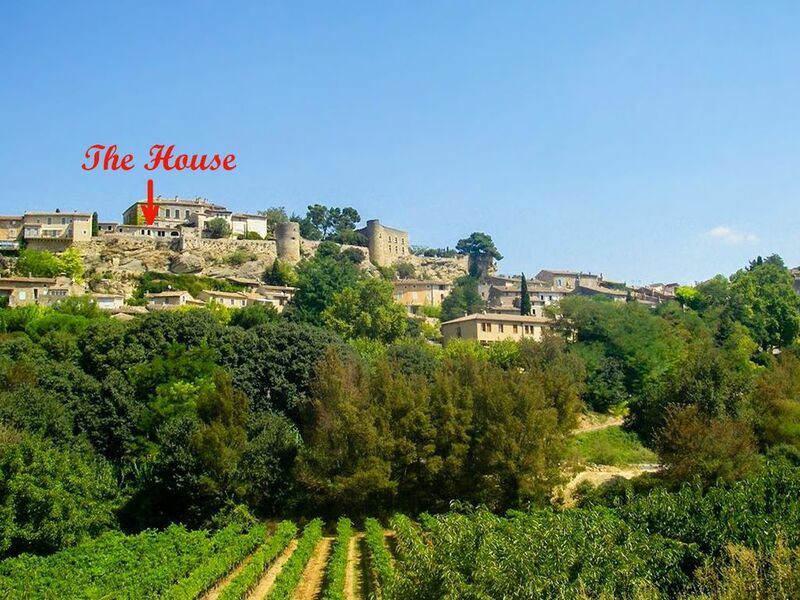 There are far too many things to do in the Luberon to mention them here, as well as day-trips to Cannes, Monte Carlo, Arles, Aix, the Camargue, Italy, Spain, the Alps, etc. The price of the rental includes all utilities (gas, electricity, central heating), local phone calls, WiFi, towels, bedlinen, visitor tax, after-stay clean, and a complimentary weekly clean for stays of more than one week. We have lived in Oppede, 10 minutes from Menerbes, since 2005, where I work on a website all about the Luberon. It was sitting there at the top of Menerbes with the best views in the village but hardly any windows to see them from. It was the village notary's office so views were not important. In renovating I added big windows everywhere and made it into a home. For stays of more than a week there is a complimentary clean and change of bedding and towels on Saturdays. Rooms are on slightly different levels with steps so may be unsuitable for small children. Menerbes is at the very the heart of the 'Golden Triangle' of the Luberon, formed by the picture-postcard, medieval hilltop villages of Menerbes, Gordes, Bonnieux, Lourmarin, Lacoste, Oppede-le-Vieux, and Roussillon. These rise up majestically from the valley of vineyards and fruit orchards below, and everything is overlooked by the Luberon mountain itself, a beautifully preserved natural park. All the villages are 5-15 minutes away. There are daily markets at a different village very day of the week. Menerbes is an hour from Marseille and Nimes International Airports, 45 minutes from Avignon train station. Within an hour's drive are Aix-en-Provence, Avignon, Arles, St Remy, Orange, the Rhone wine trail. The French Riviera is 2 hours away, Italy and the Alps 2.5 hours.